​​ GEORGETOWN – San Gabriel Park is set for a new round of growth following City Council’s approval of a $3.6 million expansion. 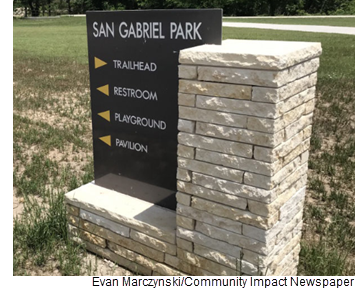 The approval funds the second of four phases of expansion and renovation of San Gabriel Park proposed through the park’s 2015 master plan. An initial phase of expansion—which includes traffic-calming measures, pavilions, restrooms, parking, a trailhead and entry monuments with signage—should finish June 2018. Construction on the second phase is expected to begin July 2018 and finish by June 2019. The second phase will include a trail extension to connect a new walking trail between the park and the Katy Crossing neighborhood, as well as other improvements.